Shopping junkie. That was who I used to be. I had more than 30 pairs of footwear and at least a dozen bags. I carried around tens of boxes whenever I moved. It was a nightmare ! I am quite organized. Like ‘Monica from friends’ organized. I have moved 11 times in the past couple of years. You learn something by moving all those times – decluttering. Well, we all horde. I don’t mean hoarding until you don’t have space to walk in your own house. I mean, that gift wrapper that you saved because it was from someone special or that pink scarf that you never wear but still hold on to because you bought it four years ago in Bali. I get it. We all hold on to things because of the memories it holds. I declutter once every year. It has been really successful. I do not own anything that I can’t fit into a suitcase and a carry on. That’s what years of travelling does to you. So here are my pro tips to declutter your apartment. Give it some thought. Take a couple of minutes to think about why you want to declutter and how it can improve your life. What helps the most is to write it down. Write down the reasons why you want to declutter and make time for it. For example, Set a day. I usually clear out a hour on a Sunday morning to clean up. Setting a time frame, always helps. One thing at a time. Start with one room or one thing. Clean up your kitchen or your wardrobe. Do not try to do everything and every room together. It’s just going to be exhausting and a bit annoying if you try to juggle it. Wearing too many hats is not the solution. If you haven’t used it in the past 9 months, you do not need it. This has helped me clear out 40% of my stuff. We all have clothes that we have only worn once, but is still in our closet because we might need to wear it someday in the future. I had a t-shirt that I haven’t used in a year in my closet, until 3 months ago when I finally got rid of it. If you follow the 9 month rule, you can truly understand how much things you use in your day to day life. I found out that I only used 6 pairs of my shoes. The rest was used maybe once or twice a year. I donated the rest to the children in the streets in India. Baggin’ it. Personally, I keep three garbage bags near me while I declutter. One for recycle, one for donation and a third throwaway bag. It really helps to speed up the process. Hanging clothes RIGHT : One of the things that I do often is to hang the clothes that I use on the right. I do it everyday. 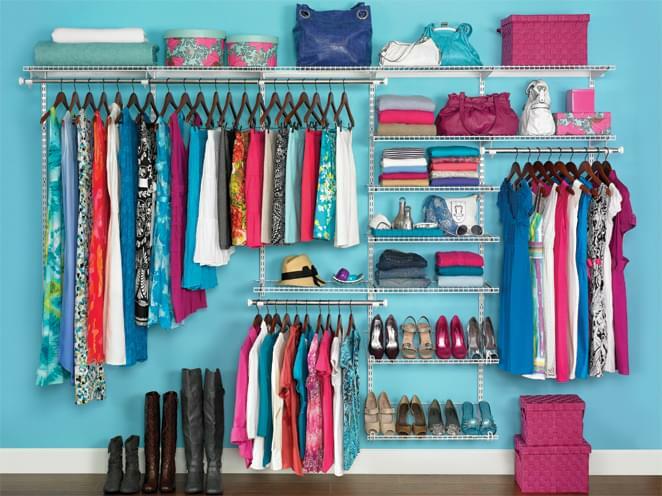 By the end of the year, you will get a clear understanding of what clothes you do not wear because they will be hanging neatly to the left. You can pick up those ones in the left and donate those by the end of the year. One item every week: One of the simplest way to get rid of things is to give one thing away every week. My mother does that and I have to admit that it is rewarding. She has donated tons of books and clothes to people in need , just by giving away one thing at a time. Ask yourself these questions: Do I wear it often ? Does it have a stain or a hole? Does it fit ? Am I keeping it because I can fix it but I have never gotten to it ? Am I saving it because maybe I can use it someday ? Am I not using it because it makes me uncomfortable ? Am I keeping it just because of sentimental value ? Do it for the people in need : I would like to encourage everyone to remember the most important point of decluttering- DONATE. That old sweater that you never use or those old dishes that you have in the kitchen might help the lives of many. I recently donated plenty of things to people in need and I must say, it felt good. A small action can make a big difference ! Do it for yourself : Decluttering brings you a step closer to a minimalist life. Less is more. Think before buying more. All the above steps would be in vain if we keep buying more and more things everyday. When you are about to purchase something, just ask yourself if you really need it. Not if you want it. But if you NEED it. That helps to cut down purchases to a minimum. Also, set up a purchase limit every month. That will help to reduce the amount of things you buy. That may include everything from books, pens, AA batteries, clothes to groceries. India : Donate to Goonj. Spain : Donate to Madrid for Refugees. If you are carrying books when you move and wants to make a difference, please donate . Education is important. 100 million people in the world are homeless. Many of them won’t survive this winter. Donate and help !